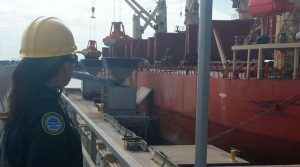 When working at seaport terminals and facilities, the successful implementation of a Facility Security Plan (FSP) is accomplished through rigorous training and adherance to the measures and procedures within. Accordingly, our officers are thoroughly trained on relevant portions of the FSP in order to be proficient in both the safety hazards and security risks specific to each terminal. Martinez and Company seaport security officers serve as the front-line of defense in preventing contraband and illegal aliens from entering the United States. They are also skilled in preventing terrorism or any other criminal behavior and are always mindful of the safety of those they are charged to protect. Our officers are also ready to fulfill their duty as First Responders when the need arises. The significant level of responsibility faced by each officer is reflected in their commitment and training. Our seaport security officers maintain access control points, observe monitoring stations, perform random patrols and conduct inspection checkpoints to maintain regulatory compliance. Intelligence – Close involvement with port security and law enforcement groups in order to stay informed of current threats and security issues. Communications – Marine Radios are issued to each duty officer to assure required vessel/facility, officer/officer and officer/USCG communications. Vessel Tracking – Our officers use state-of-the-art technology to monitor vessel arrivals so that a security presence is established prior to vessel arrival. Record Archiving – Our officers archive all pertinent records of security activities to facilitate USCG audits. Martinez and Company will also provide a security representative to assist with any security related audit.